My first Creating Change Conference — held Feb. 5-8 in Denver — was quite an experience. A definite bucket list check-off in my new life as an activist, Creating Change provided a wealth of experience, insight and access to LGBTQ leaders and strategies. Among other firsts, Creating Change at the Sheraton Hotel in Denver was my first experience with widespread use of gender-neutral bathrooms. 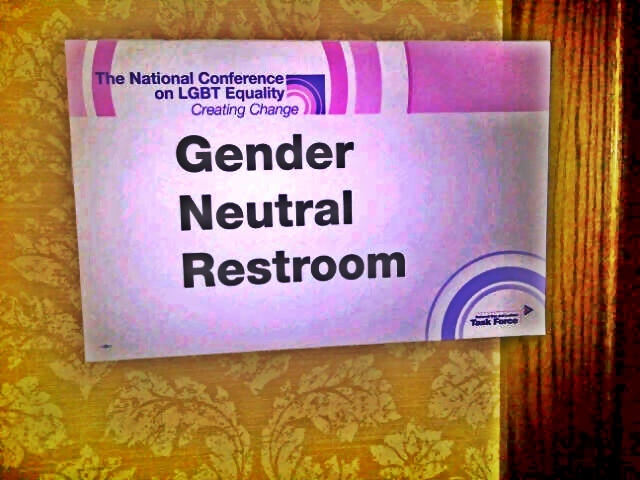 Signs outside every bathroom throughout all the spaces in the hotel occupied by the conference and its 4,000-plus attendees were replaced with “Gender Neutral” signage. There were no separate facilities for men and women but lots of facilities for everyone. Gender-neutral bathrooms ensure that everyone, particularly transgender people, feels comfortable and safe going to the bathroom. The fact of the matter is this: In some places it’s illegal for someone to choose the bathroom that matches. In many places it’s simply unsafe. I’m not ashamed to say this was something I was not at all used to, and the first time I had to go, I sought out the gender-segregated bathroom near the hotel registration area. For some reason, going to the restroom with women somehow seemed awkward, even though the bathrooms in my home have always been gender neutral, as well as those in public businesses with only one or two small bathroom facilities. But after that initial time, I gave it a shot. And by my second or third time, it was no big deal — although I would still occasionally feel a slight shock seeing a woman in the bathroom, afraid I’d gone into the wrong one. I did not go so far as to use a urinal. But many people were just fine with doing so. Despite any minor discomfort I experienced, I could only imagine what a relief these kinds of spaces are to transgender people or people who have their gender expression questioned by other bathroom-goers. I’ve heard countless stories of lesbian friends who are confronted by people making indignant assumptions about that individual’s gender and asking them to leave. And for transgender women and men, using the bathroom can actually be a terrifying experience. With these stories in mind, any momentary pause I might have had about using mixed-gender facilities dissipated rather quickly. People go to the bathroom to use it the facilities, update their social media status and check email (you know you do it too! ), wash their hands, check their hair and then … . No lack of privacy. At Creating Change, there were 4,000 people and no incidences of harassment, deviant crime, malicious activity or predators. And, judging by the overall cleanliness of the facilities, I have a hunch that the knowledge women were also using the facilities made men behave a little better — or maybe it’s just that LGBTQ activists have above-average bathroom manners. The practice of gender-neutral bathrooms is a great example for our society to consider. It might take some getting used to, but for me, if the practice takes away the fear many people experience around having to face the bathroom police, it’s well worth it. After all, we just need to pee. This article appeared in the Dallas Voice print edition February 13, 2015.